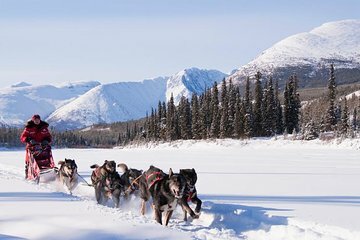 Experience winter in the far reaches of Canada’s North during this adventure-packed, five-day, guided tour in the wilds of the Yukon Territory. View the snow-covered wonderland from above during a sightseeing flight, experience dog sledding and snowmobiling, and even soak in a natural hot spring. See wildlife like caribou, goats, elk, and moose at the Yukon Wildlife Preserve and explore culture and food in the city of Whitehorse. Amazing Tour. Lots of activities and a fantastic place to do those activities. Great tour company as well.